Get excited to feed a crowd with these baked chickpea tacos. 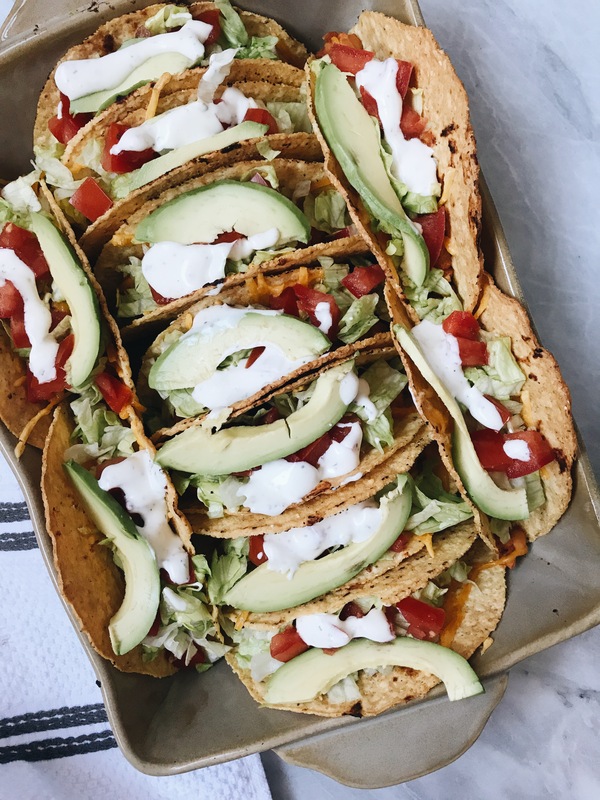 These tacos are perfect for the upcoming super bowl, of if you’re having a crowd of people coming over! I recently started liking hard shell tacos so I decided this would be the perfect time to create a recipe using them. 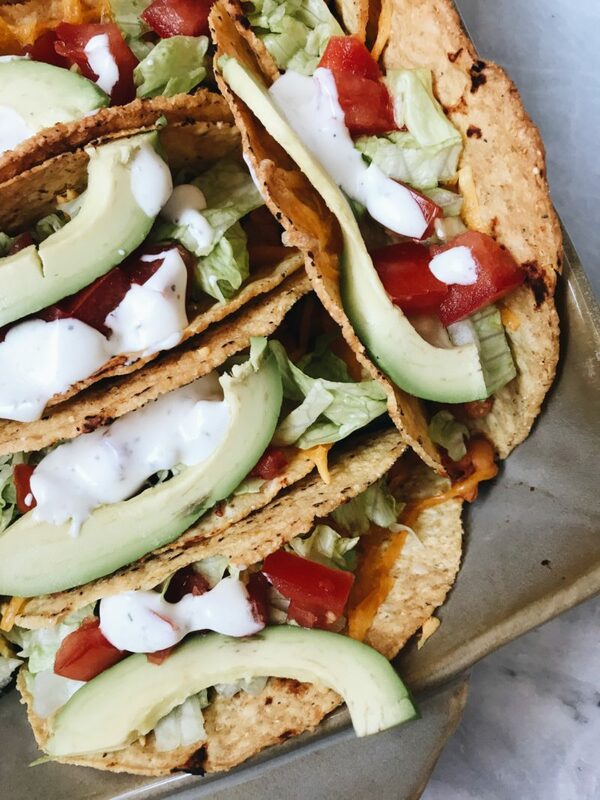 These tacos take less than 30 minutes to make and have all the flavor! For the chickpeas, I decided to use a combo of taco seasoning & salsa to spice them up. I really love the Trader Joe’s Salsa Autentica. It is more of a restaurant-style salsa meaning it is not chunky. It’s smooth, flavorful & has more of a medium spice. It is completely up to you if you want a mild, medium, or hot salsa and if you want it chunky or not. I am not a fan of chunky salsas but I imagine it would add a lot of flavor from having those chunky ingredients in it. The salsa also helps keep the chickpeas moist when baking. It’s an easy shortcut that I love. Plus, we all love easy recipes. The taco shells & taco seasoning are also from Trader Joe’s. The key to keeping these taco shells still hard is pre-baking them alone for 5 minutes. Then, you can add your chickpeas & vegan cheese (I used Daiya cheddar but it is completely up to what kind you’d like to use) and cook them for an additional 15 minutes. Then, go crazy with your toppings! This recipe calls for 12 taco shells but my clumsy self accidentally broke one, Hence why there is only 11 pictured. It is completely up to you for toppings. I love lettuce, tomato, avocado & vegan sour cream. 2 15oz cans chickpeas, washed & drained. Pre-heat your oven to 400 degrees Fahrenheit. Place your tacos shells into a baking dish. Once it reaches 400, pre-bake only your taco shells for 5 minutes. Meanwhile, drain and wash your chickpeas. Put a medium-large sauté pan on medium heat and add some olive oil. Add in your chickpeas and taco seasoning. Mix until all is combined. Add in your salsa and let cook until the salsa has coated your chickpeas and everything has warmed through. 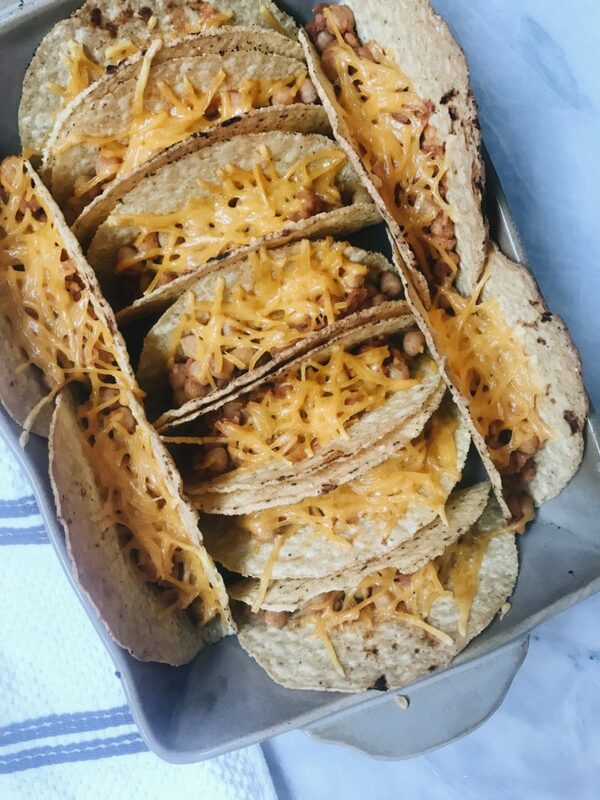 Once your taco shells have pre-baked for 5 minutes, take them out and start evenly distributing your chickpeas in each taco shell. Fill the taco shells with chickpeas until it reaches the halfway point. Top with your vegan cheese and let cook for 15 minutes. During the time they're cooking, prep your topping ingredients. After 15 minutes, add your toppings and serve! I just made these and they were super easy and so yummy! I will definitely be making these again 😊. I am so glad that you enjoyed, leAnn!